The list of questions was rather long. And over the years, I slowly (often through trial and error) collected the answers I needed to help me create the music I wanted to hear on my oboe. I learned what I needed to do if my reed played sharp. I learned what to do if my reed played flat. I even learned what to do with the kind of reed my teacher used to refer to as “flarp.” It wasn’t flat, it wasn’t sharp. It was just a mess from top to bottom. But when I founded MKL Reeds and started publishing the Reed Report (almost 6 years ago), the list of questions I had to answer about the oboe and oboe reeds began to grow again… even faster. Because these weren’t just my questions, they were the questions of my subscribers and customers… the questions of thousands of oboe players. I got questions from beginning oboe players doing their best to work with a band teacher who didn’t know much about the oboe. I got questions asking for repertoire suggestions for oboists getting ready to head off to a college audition. And I even got questions from professional oboe players, who just wanted some advice about a particular reed slump they were going through. Plus a whole lot of other questions about knives, oboe adjustments and reedmaking in general. If you’ve ever sent in a question, I have it. Because I’ve been collecting them. And they keep on coming in. But instead of answering each of them in email form and sending them back to the player who asked the question, I’m going to publish them… for everyone. I’ve taken over 100 of the top questions that have come in over the years. Questions about reeds, about the oboe, about knives, about a ton of different oboe topics. There are questions for the beginner, intermediate and advanced oboe player. I’ve pulled them all together, written out my best answers and packed them up into one book. Actually, it’s all electronic, so there’s no actual “book.” You’ll be able to login right away. Plus… I’ve taken some of the questions and added audio and video explanations just to make the answers extra clear. Videos like the one you see here about how to sharpen your knife. And Get Your Questions Answered! You can get your copy and login right away for only $37.00. Just because this book will give you the answers to over 100 questions about the oboe and oboe reed stuff, that doesn’t mean you shouldn’t continue to think for yourself. Coming up with your own answers to your questions is an important skill to develop as an oboe player. So don’t take this book as the be all and end all for everything oboe. 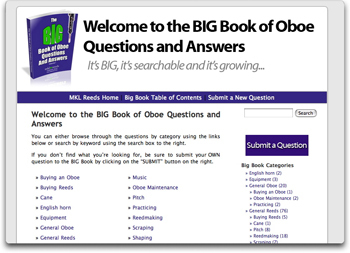 So if you think having access to over 100 questions about the oboe, oboe reeds and oboe stuff would be helpful, then take a moment right now, and reserve your copy. You’ll get your login information in just a few moments. And once you do, you can go through all of the questions and answers. And just like everything we create at MKL Reeds, your satisfaction is guaranteed. So if you login and don’t feel it will be helpful for your oboe journey, then just contact us for a full refund with no hassle at all. P.S. 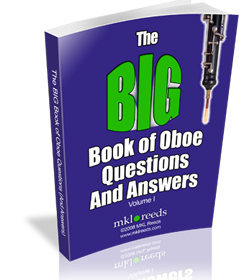 My hunch is that the BIG Book of Oboe Questions and Answers, above all of the other products we offer, will be one of the most helpful for the largest number of oboists out there. No matter what your experience level. That means that virtually every oboist should benefit from it. And that’s why I want to get it into as many oboe players’ hands as possible. P.P.S. Want to see the BIG Book in action? Just take a look at this “silent-movie.” You can see what it looks like to login, browse around AND submit your own question.